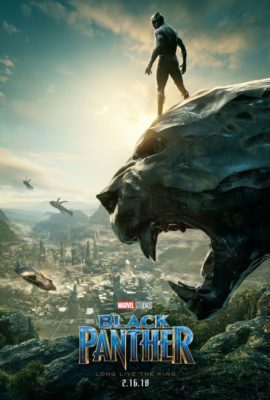 Back in 2014 Marvel announced their third phase of the Marvel Cinematic Universe (MCU), with Black Panther sitting firmly in the middle of the pack of blockbuster releases. Fanfare was excited, but mitigated compared to the fervour of adaptations of Civil War and the upcoming Infinity War. Now the film has come, but it has not gone. Opening to a staggering $320 million in its first week, the enthusiasm towards the film should present a revelation to Hollywood’s higher powers. People are looking for representation, they are looking for new stories and an update to the current rhetoric towards the modern blockbuster and Black Panther is one hell of a start. Coming from director Ryan Coogler, who previously stunned with 2016’s Creed, is a crew of talented individuals that energetically bring the film to life, from frequent collaborator Michael B. Jordan to newcomers Chadwick Boseman, Lupita Nyong’o and Danai Gurira. The world in which these characters inhabit feels so authentic and revolutionary with its afro-futurist society built on African prosperity and its idealistic representation. These two factors are the strongest points of a film that I feel is somewhat limited by its current placement in the MCU. Coogler has no doubt created a revolutionary film that will stand as the call to greater diverting stories in Hollywood cinema, yet there are problems with elements of the film itself. The majority of these come from the trajectory of the screenplay. The film does a good job in the set-up of its characters but the pace does drag in those first 40 minutes as characters are finally placed in position for the ball to get rolling. This results in a story that seems to be fighting the inherently political message it wants to deliver against the ever-present ‘Marvel-ness’ of it all. The other problem stems from an over-reliance on sometimes dodgy CGI that seems to crowd the often beautiful frames from recent first-time Oscar nominee Rachel Morrison. Despite its franchise connections, it is easy to see how the Disney behemoth was the only vehicle available to bring forth this seemingly revolutionary film. While these missteps do take away from some of my own personal enjoyment of the film it is more than made up by the outstanding character work from Michael B. Jordan who provides the MCU’s most compelling and well rounded villain as Killmonger and delivers the most satisfying and heart wrenching monologue at the end of his arduous journey. The soundtrack also provides a wide range of hip-hop cuts from the likes of Kendrick Lamar and SZA that helps to pull the story in interesting sonic directions. The success of this film paves the way for more fruitful future representations to be seen on screen. Audiences are more than ever hungry to see themselves on the big screen. It is their time to finally have that powerful reflection cinema offers.